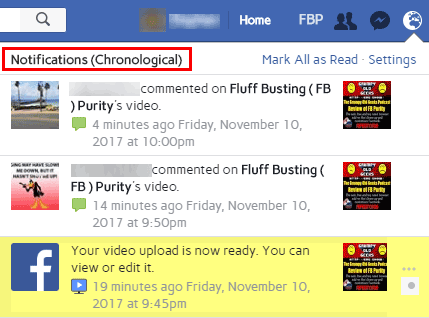 New: “Sort Notifications Chronologically” option, located under the new “Notification Options” section of the FBP options screen. This option shows the popup notifications that appear when you click the globe icon in the correct time order, rather than the order Facebook thinks you would like to see them in. How the notifications look with FBP”s “Sort Notifications Chronologically” option turned on. New: Set “Notifications background colour” option, located under the new “Notification Options” section of the FBP options screen. Facebook’s default unread notification background colour can be hard to distinguish from that of the read notifications. Moved the “Hide popup notifications” option to the new “Notifications Options” section of the FBP options screen. This option now also hides the “Next Unread” and “New Notification from:” popup that sometimes pops up below the globe icon in the top navigation bar. New: I’ve fixed it so you don’t need to be logged in to view “Like Pages” aka “Fan Pages” anymore, previously if you tried to view a Fan Page while you were logged out, Facebook would badger you to log-in otherwise it wont show you the page. FB Purity is now available as an official Microsoft Edge extension available directly from the Microsoft Edge store So the old method of installing the FBP GM Script via the Tampermonkey extension is no longer required. If you install the official Edge FBP extension from the Microsoft Edge store, it should auto update when new versions are released in future. Be aware however that the Microsoft Store has a slow (manual) approval process for accepting extension updates, so the new version will not show up in the Microsoft Store for a day or two after I release an extension update. For those who don’t already know, FB Purity is a safe, free and top rated web browser extension for Google Chrome, Firefox, Edge, Safari and Opera . It lets you clean up the junk and customize Facebook the way you want it to be. It has many cool features, such as hiding all the ads, alerting you when friends un-friend you, letting you change the site’s colours, fonts and background image, it lets you stay on the “Most Recent” feed permanently and lots more. 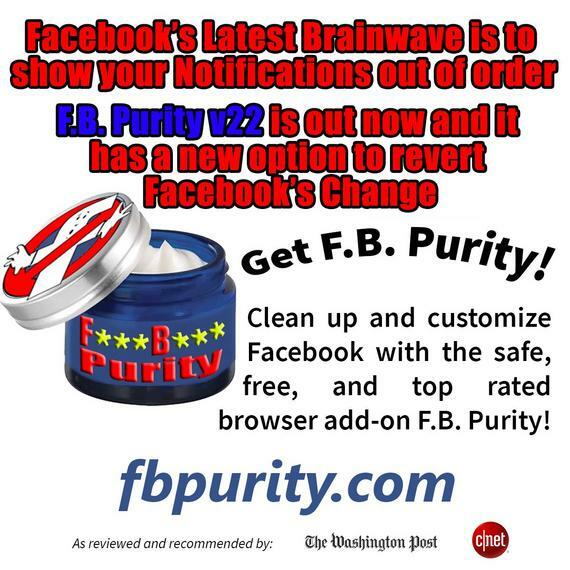 FB Purity has been reviewed and highly recommended in many places including the Washington Post, CNET, PCWorld, MacWorld, GetConnected etc and has over 402,000 users worldwide. This entry was posted in Facebook, FB Purity and tagged block all facebook ads, block facebook ads, change notifications background color, chronological notifications, clean up facebook, customise facebook, Customize Facebook, Facebook, facebook ad blocker, Facebook Customization, FB, FB Purity, FB Purity Update, FBP, FBP Update, fluff busting purity, hide annoying posts, hide facebook posts, how to get facebook notifications sorted chronologically, how to sort notifications on facebook chronologically, how to view facebook notifications in chronological order, how to view facebook notifications in correct time order, sort facebook notifications in chronological order, sort notifications in chronological order, view notifications in chronological order. Bookmark the permalink. If I read a post from a site like National Geographic that I don’t want to see again and again. How do it stop it from repeating with every comment? I have hit the X but they still seem to come back. I don’t want to unfollow them. I just wan’t to read and be done with it.